The present report is being submitted to the Human Rights Council in accordance with Council resolution 36/31. 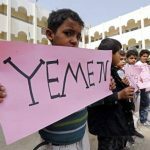 Part I of the report contains the findings, conclusions and recommendations of the Group of Eminent International and Regional Experts on Yemen. Part II provides an account of the technical assistance provided by the Office of the United Nations High Commissioner for Human Rights to the National Commission of Inquiry into abuses and violations of human rights in Yemen. 17. In 2011, a popular revolution arose against the 33-year rule of Ali Abdullah Saleh, President of Yemen. A deal brokered by the Gulf Cooperation Council granted Saleh immunity and transferred power to Vice-President Abd Rabbo Mansour Hadi. Yemenites conducted a National Dialogue Conference, accompanied by a constitution-making process. In 2014, the conflict escalated between the government forces led by President Hadi, the Houthis and other armed groups over power-sharing arrangements and the draft constitution. In September, the Houthis and the armed forces aligned to former President Saleh seized and consolidated control over the capital, Sana’a and other parts of the country. 18. 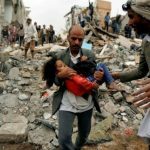 In March 2015, Saudi Arabia formed a coalition with Bahrain, Egypt, Jordan, Kuwait, Morocco, Senegal, the Sudan and the United Arab Emirates to initiate military action at the request of President Hadi.1 The United States and the United Kingdom, among other States, advise and support the coalition. The coalition forces launched an air campaign causing significant civilian casualties. On 8 October 2016, in one of the deadliest incidents, the coalition targeted Al-Kubra Hall in Sana’a during a funeral, killing at least 137 male civilians and injuring 695, including 24 boys. In addition to air strikes, coalition naval forces imposed severe restrictions and, in late 2017, enforced a de facto blockade on Yemeni seaports, hindering imports of essential supplies to the country. In August 2016, the coalition effectively closed Sana’a International Airport. The airport remains closed to commercial aviation to date. 19. 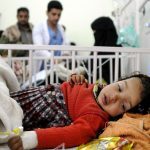 Intense hostilities continue in certain parts of Yemen despite the grave humanitarian impact on the population. The violence is exacerbated by food insecurity, limited access to health care and restrictions on imports of vital commodities. The non-payment of public sector salaries since August 2016, following the Government’s move of the central bank from Sana’a to Aden, has also had a devastating impact on civilians. 20. The well-established front lines remain largely unmoved after three years of fighting, although control of territory continues to change hands at the local level. The United Arab Emirates has established control across southern Yemen, both by its direct action and through its proxy forces, namely the Security Belt Forces, the Hadrami Elite Forces and the Shabwani Elite Forces, despite resistance from President Hadi, who has disavowed those forces (see S/2018/242). 21. 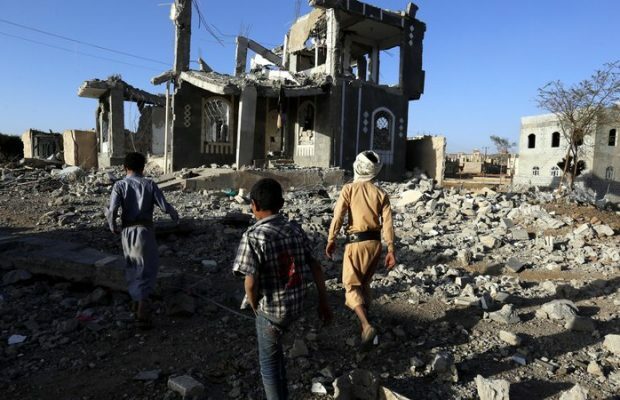 In 2015 and 2016, suicide and other attacks, claimed by Al-Qaida and groups affiliated with the Islamic State in Iraq and the Levant, ravaged Sana’a, Aden and elsewhere, resulting in high civilian casualties. 22. On 4 November 2017, the Houthis fired a missile into Saudi Arabia. Two days later, the coalition announced a complete blockade of all the country’s borders — air, sea and land; over the following weeks, it was gradually lifted. In 2018, the Houthis continued to launch missiles into Saudi Arabia. 23. The simplistic view of a binary conflict between the Government and the HouthiSaleh alliance, while never accurate, had become increasingly muddled as loyalties shifted, armed groups proliferated and factions fragmented. 24. Following continued tensions between the Houthis and Saleh allies, their forces clashed in Sana’a in December 2017. Former President Saleh was killed by the Houthis. In January 2018, the Southern Transitional Council, established in May 2017, declared a state of emergency in Aden and its supporters clashed heavily with government forces. A cautious calm resumed following intervention by the coalition. The Southern Transitional Council forces, backed heavily by the United Arab Emirates, continue to control major cities in southern Yemen. 25. In June 2018, the coalition and affiliated forces launched an offensive on Hudaydah. After a few weeks, it was halted, ostensibly to allow space for United Nations mediation efforts. As over 120,000 displaced people have fled the governorate, humanitarian agencies have warned of grave risks to civilians if fighting affects the critical port city. 26. 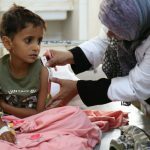 Since March 2017, the Office for the Coordination of Humanitarian Affairs has designated Yemen as the world’s largest humanitarian crisis. In April 2018, out of a population of 29.3 million, 22.2 million persons were in need of humanitarian assistance, including 11.3 million in acute need. Needs extend across all sectors, including health, food, sanitation and water, housing and protection.